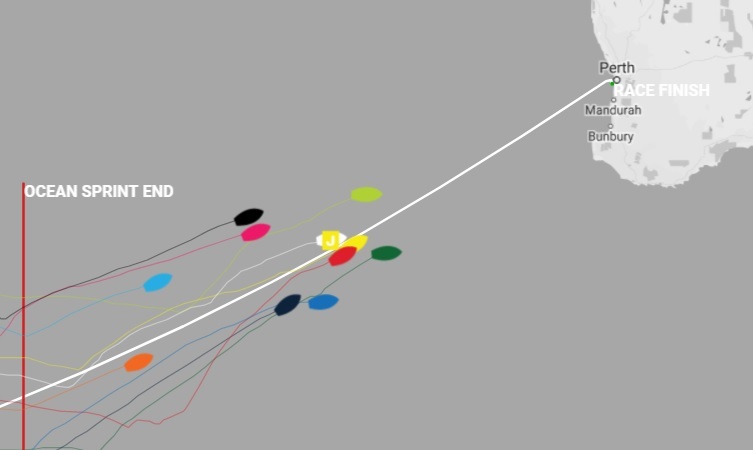 In the past 24 hours, HotelPlanner.com was the final boat to cross the finish line of the Elliot Brown Ocean Sprint and, after all boat times were calculated, was declared the winner taking three points after racing the course in the quickest time of 26 hours and 44 minutes. Visit Seattle had the second quickest time claiming two points with 27 hours and 4 minutes, and PSP Logistics picked up the final point with the third quickest time of 29 hours and 39 minutes. Wendy Tuck, Skipper of current race leader Sanya Serenity Coast, was quick to congratulate her rival Skippers: “Well done Conall, Nikki and Matt on your Elliot Brown Ocean Sprint points. There’s not much sprinting going on right now - we have found the world famous Indian Ocean ‘keep you away from the cold wine’ Doldrums. Yesterday’s race leader, PSP Logistics, is currently in Stealth Mode with Skipper Matt Mitchell explaining: “I opted to go for secret squirrel so that the guys behind won't be able to gauge our progress, be it good or bad, meaning that they can't sail around us or follow our route through if it's successful. PSP Logistics will re-emerge from its invisibility cloak at 1800 UTC this evening meanwhile Visit Seattle is the latest team to go in to Stealth Mode and will be until 0600 UTC tomorrow. Clipper Race Meteorologist, Simon Rowell, has good news for the teams once they get through the latest wind hole reporting that the satellite image shows clouds streaming downwind from Cape Leeuwin, so there is wind going the right way once the teams get through it. For an idea of when the fleet is expected to cross the Finish Line, please see the Estimated Arrival Times on the Clipper Race website.